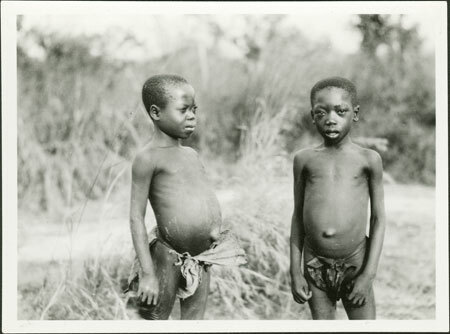 Two boys, one posed turned half-sideways showing expanded abdomen (associated with malnutrition) and abdominal hernia, the other front on. One is identified as wiri Bamina (i.e. a son of Bamina). Morton, Chris. "Two Zande boys" Southern Sudan Project (in development). 03 Jan. 2006. Pitt Rivers Museum. <http://southernsudan.prm.ox.ac.uk/details/1998.341.290.2/>.